It's been way too long since I last posted on my blog - but the truth is I haven't been in my sewing room for the past couple of months. Life changes got in the way and I just didn't feel like sewing. That does happen sometimes. Now I'm feeling back on track though and have been busy in my sewing room today. I finished another large flying geese block and lots of flying geese strips are sewn together ready to be assembled into more blocks. 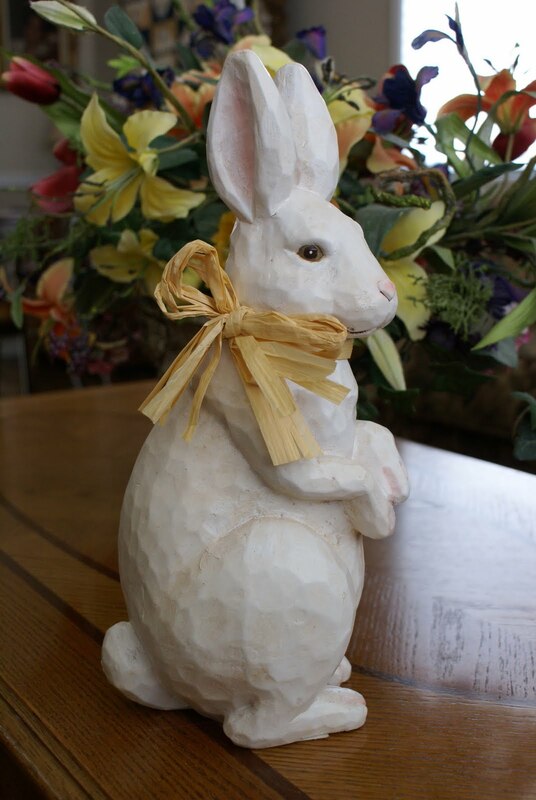 With Easter just around the corner, I've been out shopping for new rabbits to add to my collection and brought this very handsome rabbit home. I also worked on this new look for my blog. I've been looking for a new background for a while and finally found one I loved on Scrappin' Blogs . There are some very pretty backgrounds on this site. 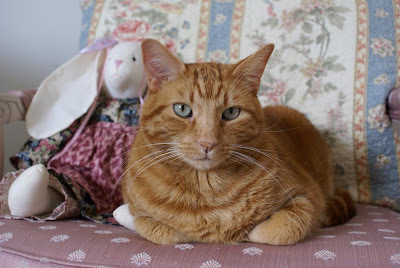 Although Ted won't readily admit it, I think he likes rabbits too ;) - curled up with that old bunny I made years ago.